The drama that earned Academy Award® nominee Diane Lane ('Unfaithful') an Emmy® nomination for her performance is coming to Blu-ray in April. In an early announcement to retailers, HBO is preparing to release 'Cinema Verite' on Blu-ray on April 24. When reality became entertainment, everything changed. 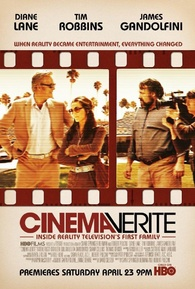 "Packing an emotional punch that's as surprising as it is eloquent" (The Wall Street Journal), 'Cinema Verite' is the compelling behind-the-scenes story of the revolutionary 1973 PBS documentary series An American Family which catapulted an ordinary family to notoriety and captivated audiences with the launch of a new television genre - reality TV. Fascinating and illuminating, 'Cinema Verite' stars an amazing ensemble cast. Along with Lane, the film features Academy Award® and Golden Globe® winner Tim Robbins ('Mystic River') and Golden Globe® and Emmy® winner James Gandolfini (HBO's "The Sopranos"). Shari Springer Berman and Robert Pulcini directed a script written by David Seltzer. Specs have not been set yet, but supplements include The Making of Cinema Verite and audio commentary from directors Shari Springer Berman & Robert Pulcini and star Diane Lane. Suggested list price for the Blu-ray is set at $24.99. You can find the latest specs for 'Cinema Verite' linked from our Blu-ray Release Schedule, where it's indexed under April 24.